Last month I wrote about a story’s hook. And two weeks ago Robin wrote about reversals, the big and the small. 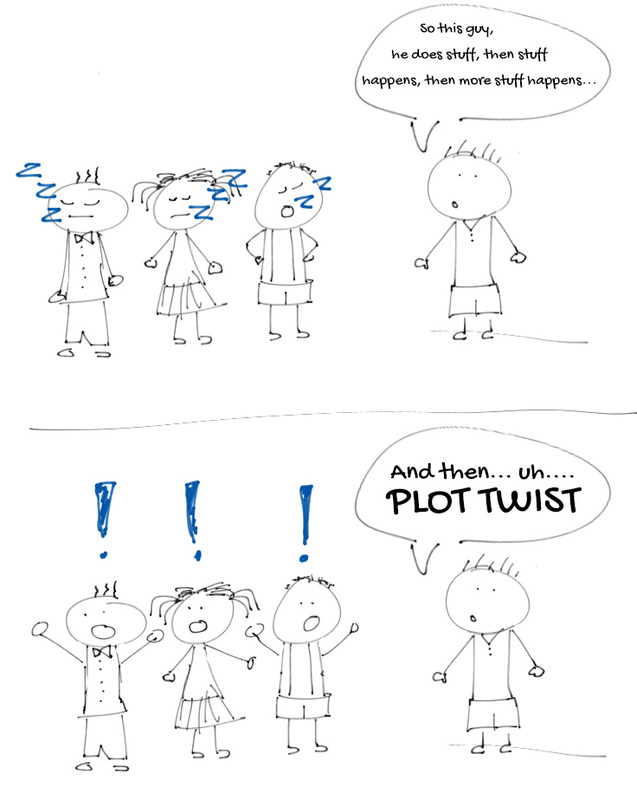 For the purpose of this post, I’m talking about the big type of reversal – the plot twist! I’ll explain how I got twists and hooks mixed up and how to tell them apart. To refresh, a HOOK is what draws people to your book and makes them want to read it, and a PLOT TWIST is when your story takes a sharp turn due to a surprise reveal of information. The hook is linked to an event that happens early on in the story (Act I), and a plot twist happens later (Act II or III), often at such crucial moments like the MidPoint or the Crisis or The End. Bob is pitching his story idea, but his friends are losing interest so he hits them with the plot twist! Now they’re riveted and all totally agree they’d want to read his book. Bob thinks he has a winner and his awesome plot twist is his hook! But the reality is that readers will be disappointed if he reveals the big twist on the book jacket (where one finds a novel’s hook). Plot twists are so exciting and catchy that it’s tempting to use them to hook your audience. But if you need the plot twist in the pitch, either a) you don’t have a hook, or b) what you think is the plot twist is actually the hook. If the beginning of your story doesn’t grab people, it might be because you haven’t found a way to connect the reader to your characters. That emotional connection leads to the hook, because the trick to every great hook is making the reader care what happens to the hero. If they don’t care, they won’t read. Heather (yep, me) comes up with a story concept about a drug that turns teens into psycho killers. She goes through about two dozen outlines trying to figure out where to start the story, and decides that backstory is boring and she should start at the moment the teens use the drug and start killing. After all, that’s what grabs her about the story, so that’s probably the hook, right? My instincts weren’t wrong about starting with the murders, but where I screwed up is having my heroine know why the murders are happening. Putting that information (the drug makes them kill) right up front robs my story of suspense. Seeing characters figure stuff out is fun and – in a horror – scary. However, if I don’t reveal this, that means my pitch is simply, “Teens are getting murdered.” That’s not much of a hook. Same as above, I need to draw the readers into the story via the characters. Time to flush out that character sketch and make people care about my heroine! Of course, it’s up to the writer whether a plot point is a hook or a plot twist. As stated above, the biggest difference between the two is where they occur in the story (hook in Act I, plot twist in Act II and/or III). It really depends on what genre you’re writing, how you structure the story, and what effect you want that information to have on the reader. Do you want it to be a surprise? Then it’s a plot twist. Do you want the reader to know that information right from the beginning? Then it can be a hook. Just be aware of these choices and don’t do what Bob did – use his end twist as a way to hook his audience. After all, can you imagine if the movie trailer for The Usual Suspects told us who was Keyser Söze! That would have ruined it! Huh, I always call those chapter ends “cliffhangers” (Robin wrote a blog post on those) or more specifically “unresolved-conflict-that-makes-the-reader-want-to-find-out-more”. I wonder what other people call them. It’s interesting to hear everyone’s terminology, and crucial so we all know if we’re talking about the same thing! Thanks for the comment, DL! Nicely explained. It is always difficult getting the balance right between forward momentum and plot twists and turns. It’s always a good idea to have the reader working hard (not too hard) to solve a puzzle. Look at Dan Brown’s ‘Da Vinci Code’, every chapter has a puzzle and that was no slouch on the charts. Very true! I love puzzles! But I’m still working on that balance. Thanks for reading and so glad you enjoyed the post!